Visiting Rincón de Guayabitos Mexico means returning home with a suitcase full of colorful souvenirs. It might be for this reason, or perhaps for its calm Pacific Ocean swells and exceptional weather, that this is one of the most visited Nayarit destinations. Guayabitos is a favourite destination for families from all over Mexico. With Banderas Bay (famous for resembling a giant swimming pool) and its pearly fine sand, Guayabitos Mexico boasts a two-kilometer (1.25 mile) stretch of incredible beach. Guayabitos beach also measures more than 30 meters (100 feet) wide and is bathed by the tranquil, crystal-clear Pacific Ocean waters. Guayabitos beach is a constant celebration of color and joyous activity. It is common to see children building sand castles, jumping in the gentle surf, and playing with their siblings on these tropical shores. You will also find young people playing volleyball or soccer or enjoying a myriad of water things to do. Entire families gather together here on Guayabitos beach to enjoy traditional Mexican fare. Locals and visitors alike are snapping photographs or videotaping the memorable moments of their vacation here in Guayabitos Mexico. The tropical vegetation, pleasant climate, and calm Pacific Ocean swells are perfect for various water sports and have made this part of Riviera Nayarit a premier family destination. The development of Rincon de Guayabitos Mexico began over 30 years ago with the construction of numerous resort hotels, residential areas, and various businesses and infrastructure. Guayabitos now has a wide variety of accommodations available for overnight visitors including all-inclusive hotels, bungalows, bed & breakfasts, rental homes, condominiums, and RV parks. Be sure to check out hotels like Anai Suites, Casablanca Resort, and Costa Alegre Hotel and Suites. Dining in Guayabitos is exceptional. You can enjoy an assortment of culinary delights including traditional Mexican favorites, like grilled fish, plus a wide variety of tasty treats such as coconut bread, flavored shaved ice, fried bananas, and dishes prepared with yaca, a tropical fruit typical of the region. And don’t forget to try a traditional Crazy Pineapple, a delight that combines this fruit with chili powder and sweet syrup. 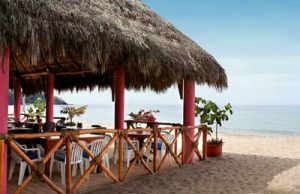 Among the other Nayarit beaches found in this area is Playa Las Minitas, located two kilometers (one mile) south of Guayabitos, near the town Lo de Marcos. This beach measures 500 meters (1,640 feet) long by 40 meters (131 feet) wide, and is separated from the neighboring beach of Playa Los Venados by a small rock formation. Found just half a kilometer (0.3 miles) from Las Minitas, Los Venados is a semi-virgin Pacific Coast beach with exuberant vegetation. Los Venados is also the ideal place to rest and admire the natural beauty of the area. Don’t forget to visit the islands of Isla Coral and Isla Cangrejo, both representative symbols of Guayabitos Mexico. These islands allow you to admire beautiful natural landscapes close up. They are a virtual bird watchers paradise allowing you to witness an incredible variety of local and migratory birds including pelicans, seagulls, and Blue-Footed Boobies. You can also try your hand at scuba diving or snorkeling in the turquoise-blue waters surrounding Isla Coral and Isla Cangrejo. After your fun-filled day of sun, sand, and sea, take some time to stroll down the main avenue of Rincon de Guayabitos Mexico. Here you will find a wide variety of souvenir and handicraft shops selling all sorts of wonderful treasures. You will marvel at the workmanship of the colorful beaded works made by native Huicholes of the region. You will also find beautiful silver jewelry, hand-embroidered clothing, and other interesting items such as starfish and marine flowers. Discover the friendly nature of the people of Guayabitos Mexico. Take in the folklore of this vacation destination that borrows its name from the guayabo (guayaba), or guava tree. The guava tree, which was discovered long ago by the Spanish, grows locally and was used frequented by English and Dutch ships. 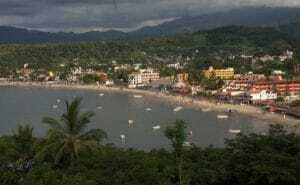 Come vacation in Riviera Nayarit and visit Rincon de Guayabitos Mexico!